The meteor explosion over Russia that injured more than 500 people and damaged hundreds of buildings was not caused by an asteroid zooming close by the Earth today (Feb.15), a NASA scientist says. NASA asteroid expert Don Yeomans, head of the agency's Near-Earth Object Program Office, told SPACE.com that the object which exploded over a thinly inhabited stretch of eastern Europe today was most likely an exploding fireball known as a bolide. More than 500 people were injured, mostly by glass cuts when windows shattered during the blast, according to the Russian Emergency Ministry. Yeoman stressed that the bolide event was likely not associated at all with the incoming asteroid 2012 DA14, which will fly within 17,200 miles (27,000 kilometers) of Earth when it passes safely by our planet today. "The asteroid will travel south to north," Yeomans said. "The bolide trail was not south to north and the separation in time between the fireball and 2012 DA14 close approach is significant." Asteroid 2012 DA14 is 150 feet (45 meters) wide — about half the size of a football field — and will make its closest approach to Earth at 2:24 p.m. EST (1924 GMT) when it passes over Indonesia. It will be about 5,000 miles (8,046 kilometers) closer to Earth than the communications satellites circling the planet in geosynchronous orbits. NASA scientists and professional and amateur astronomers around the world have been tracking asteroid 2012 DA14 since it was first discovered by a team of amateurs in February 2012. Not only does the asteroid pose no threat to Earth during today's flyby, but it will not hit Earth for the foreseeable future, NASA scientists have said. Visit SPACE.com today for complete coverage of asteroid 2012 DA14's flyby. 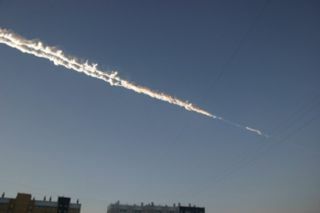 Editor's note: If you snapped a photo of the meteor explosion over Russia that you'd like to share for a possible story or image gallery, send photos, comments and your name and location to managing editor Tariq Malik at spacephotos@space.com.